This promotion has ended, but the ebooks listed are still available individually. Check them out! Back in December, I wrote about Advent with my 3 and 4 year old and my love for Truth in the Tinsel. I was obsessed with the super creative ebook that helped me teach the meaning of Advent to my young children. It went so well and I can't wait to do it again this year! 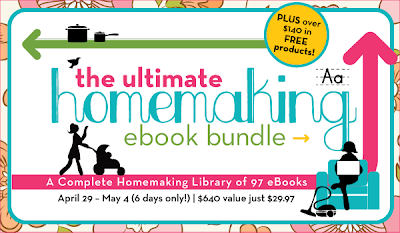 Well, Truth in the Tinsel has joined up with 96 other ebooks called The Ultimate Homemaking eBook Bundle. The bundle includes books on a range of topics like holidays, homeschooling, spiritual growth, time management, meal planning and more! A $640 value for $29.97....$.21 per book which is amazing, especially for the wealth of knowledge and quality of content that you will receive. Raising Rock Stars — Kindergarten Bundle by Carissa @ 1plus1plus1equals1 ($10.00) I have used other bundles from this site and my kids LOVE them! Tell Your Time by Amy @ Blogging with Amy ($2.99) Amy is a Blogger's Blogger. If you need to know how to do something or sort something out as a new or even seasoned blogger, she has the answers! I can't wait to see what she has to say about balancing it all and managing time. The sale begins Monday so stop back for more information and the links to buy. I am super excited!